Since our Australopithecine ancestors learned to shape stones into tools ~3.3 million years ago, hominid relationships and knowledge creation have been mediated by, negotiated through, and expressed in technological innovations, a meandering but cumulative line — from rock to rocket, from Lucy to Musk — that may help us create a new Levant in the orange dust of Mars, in an evolutionary leap that takes us away from home, to where our reliance on technology will be absolute. “Without technology, we are not human” (McGreal, 2017). Without humans, and our imperative for social interaction, technology would not exist. While Russell’s (1999) meta-analysis revealed “no significant difference” in learning outcomes when comparing face-to-face and distance education (DE) contexts (absent pedagogical change), critical differences emerge when technology-enabled pedagogical changes are considered. Interactive online technologies afford pedagogical potential that correlates to improved learning outcomes in DE and blended learning contexts. In this paper, I explore the pedagogical potential afforded by one interactive technology tool – online discussion forums – for enhanced social presence and learner-centredness, towards improved learning outcomes. Two pedagogical strategies – scaffolding, and forum management – are considered within DE and blended learning. Scope is limited to higher education and professional training contexts. This entry was posted in Constructivist Learning, Distence Education Theory and Research, Frameworks for Guiding Technology Use, Instructional Design, Mobile and Emerging Technologies, Research and Perspective on Technology in Education on December 11, 2017 by Kelli. This paper describes a distance education institution for rural secondary students in Canada’s Prairie Provinces (Alberta, Saskatchewan and Manitoba), premised on a hypothetical collaborative initiative arising from a Canadian Association of Principals conference where the challenges facing rural education were explored. This hypothetical initiative was advanced through discussions with respective schools districts and provincial associations. A preliminary proposal garnered funding for a market assessment that confirmed a viable niche market (Simonson, Smaldino, Albright, & Zvacek, 2012). The Open Prairie Lyceum (OPL) concept comprises a federated distance education (DE) school model to serve rural areas, where school abandonment and dwindling enrolments impede students’ learning experiences and access to quality and comprehensive education, and undermine community sustainability (Bennett, 2012; Oncescu, 2013). OPL addresses the economic needs of rural areas by enabling students to develop relationships and gain local work experience, preparing them for higher education, training and careers that may contribute to long-term rural development and revitalization and encourage students to remain in their rural homes permanently (Indiana Partnership for Statewide Education, 2000; Lemoine & Ramsay, 2011; Simonson, Smaldino, Albright, & Zvacek, 2012). This entry was posted in Constructivist Learning, Distence Education Theory and Research, Instructional Design on August 5, 2014 by Kelli. Course development and design in distance education (DE) should respond to specific learning outcomes and assessment objectives determined in advance, and should incorporate two fundamental principles that Simonson et al. (2012: p. 153) identify as critical to a student-centred approach: 1) Visual-based instruction (appropriate for and capitalizing on digital media), 2) Engaging students (through collaborative work and social connectedness). 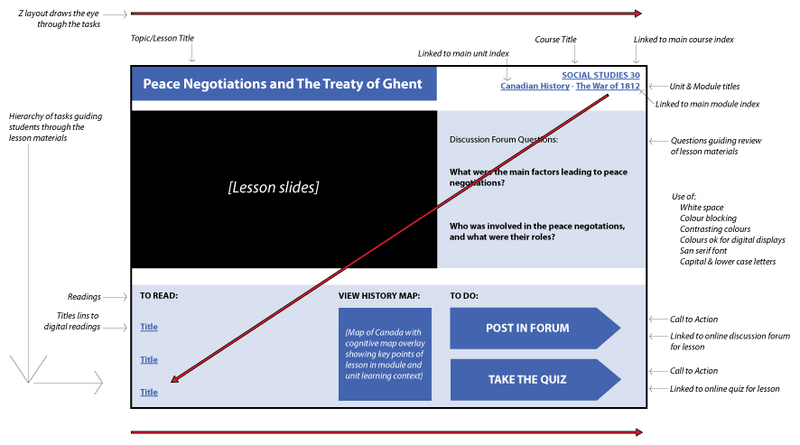 Here is an example of a lesson on a course site within a CMS. This lesson incorporates best practices for visual design (Simonson et al., 2012) with z-layout for web design (Jones, 2010), and applies a linear-designed instruction approach and Unit-Module-Topic organization (Simonson et al., 2012). Simonson, M., Smaldino, S., Albright, M., & Zvacek, S. (2012). Teaching and learning at a distance: Foundations of distance education (5th edition). Boston, MA: Pearson. This entry was posted in Distence Education Theory and Research, Frameworks for Guiding Technology Use, Instructional Design, Research and Perspective on Technology in Education on July 31, 2014 by Kelli. George Siemens’ (2005) article “Connectivism: A Learning Theory for the Digital Age” has sparked both innovation and controversy. In stark contrast to Clark’s (1983) analogy that the truck delivering our groceries does not impact our nutrition, “only the content of the vehicle can influence achievement” (Clark, 1983, p. 445), Siemens suggests in the current knowledge economy “the pipe is more important than the content in the pipe” (Siemens, 2005, p.6). As the article unfolds, however, a more apt rendering may be that connectivism repositions media as a type of content, in that media, as tools of cognitive engagement, have the potential to transform the content of learning. The editor’s note accompanying Siemens’ publication describes it as a “milestone article”. From a theoretical standpoint, connectivism is important because it integrates existing learning theories (Ally 2004) – namely, behaviourism, cognitivism and constructivism – and provides a framework for pedagogy that is responsive to evolving technology and its incorporation in distance education. The impetus for developing new pedagogy, according to Siemens, is that these existing learning theories were formulated before technology “reorganized how we live, how we communicate, and how we learn” (Siemens, 2005, p. 1), and do not encompass types of learning relevant for the digital age. Connectivism deals with learning – actionable knowledge – that involves developing meta skills for delineating patterns and connections within a mass of technology-mediated knowledge that is rapidly changing/increasing and only tenuously under the learner’s control; evaluating the value of content (i.e. whether information/knowledge is worth being learned); and determining when and what knowledge should be retired and replaced with updated knowledge (the meta skill of unlearning obsolete knowledge) (Siemens, 2005). [Siemens provides Gonzales’ (2004) definition of knowledge half-life – the interval between the time knowledge is acquired and the time it becomes obsolete – to describe the changing nature/character of knowledge in the digital age.] Additionally, connectivism describes and accounts for new types of knowledge, such as the Semantic Web as well as collective/collaborative learning and knowledge production (Siemens, 2005; Anderson, 2004). Ally (2004) suggests a connectivist framework has the potential to inform instructional design for both machines and humans and for how these agents interact. Siemens is careful to establish theoretical links between connectivism and these earlier learning theories. Referencing Driscoll (2000), Siemens describes that in behaviourism and cognitivism knowledge is external to the learner, and in constructivism knowledge is created as the individual creates meaning from external, complex experiences and that learning is often personalized. In describing connectivism, Siemens draws on the systems concepts of nodes and networks, invoking similar concepts and the terminology used in cognitivism to describe information processing; constructivism’s concepts of learner-centred learning and instructor-as-facilitator (Ally, 2004; Duffy & Cunningham, 1996); and behaviourism’s community-centred social cognition. (Anderson, 2004; Vygotsky, 1978). However, Siemens effectively grounds connectivism in chaos theory, complexity and self-organization theory, and network theory (networks, small worlds, weak ties), referencing Rocha (1998), Wiley & Edwards (2002) and Barabàsi (2002), respectively. He identifies eight principles of connectivism, describing the individual (node) <-> network <-> organization relationship and the embedded learning processes, opportunities for networked scaffolding (Anderson, 2004), and vital meta skills (described above). As a theory, connectivism has the potential to generate testable hypotheses and provide a mandate for research, to inform emerging pedagogy, and to provide a framework for instructional strategies and learning environments that are “simultaneously learner-centred, content-centred, community-centred, and assessment-centred” (Anderson 2004, p. 67). This is true for education in general, and for distance education in particular. Because of its general distance-based delivery model and widespread incorporation of technology applications, distance education is uniquely positioned to incorporate the enriched, connected, networked learning that connectivism envisions. The individual, and his/her abilities to create a personal learning network, is the “starting point of connectivism” (Siemens, 2005, p. 6). Anderson (2004) and Cobb (1997) describe that instructional design that places media in the hands of the learner makes learning more constructive. In distance education, technology-mediated learning may provide for richer learning experiences than those facilitated in traditional classroom instruction. For instance, constructivist learning is facilitated by learners creating their own learning paths through content via hyperlinks (Anderson, 2004). Consistent with Perraton (1988), connectivism renders the role of teacher to that of facilitator, though Perraton specifies this occurs when rich media (such as videoconferencing that facilitates face-to-face communication) transforms the relationship (Simonson, Smaldino, Albright & Zvacek, 2012). In connectivism, the teacher/facilitator aids the learner in developing meta skills for creating connections and evaluating knowledge/information. Connectivism’s focus on a learner-centred approach mirrors trends in distance education research, especially research examining the impact of interaction patterns, not just achievement, on the learning environment (Simonson, Smaldino, Albright & Zvacek, 2012). In terms of research rigour, learning assessment that evaluates the acquisition of meta skills, instead of or in addition to achievement in terms of content knowledge, is applicable across learning environments (distance education and classroom instruction), with the potential to yield more valid inter-group comparisons because effect sizes would likely be less variable. The networked learning environment envisioned by connectivism similarly resonates with post-Fordist theory in distance education and with open learning theory, both of which describe the personalization of learning, distributed networks, decentralization of delivery and curriculum development with the flexibility to respond to local and individual needs and priorities rather than focusing on mass production and mass consumption (Simonson, Smaldino, Albright & Zvacek, 2012; Edwards, 1995). However, while interaction and collaboration are essential in connectivism and developing the meta skills connectivism espouses, they may not be (as) critical in distance education (though research demonstrating this focused on learners’ perceptions rather than achievements) (Simonson, Smaldino, Albright & Zvacek, 2012). Anderson (2004) describes how these restrict learner independence traditionally associated with distance learning. For example, synchronous videoconferencing at minimum imposes specific time commitments. The implication for instructional design is to ensure a complementary balance (Anderson, 2004), in line with connectivism’s two-way, networked learning environment. Siemens lays out a clear blueprint for connectivism, grounding it theoretically and providing relevant evidence, with one obvious exception. In the article’s introduction, Siemens lists contemporary learning trends to which connectivism responds, but provides no references. In particular, Siemens states the use of technology tools is altering our brains and reshaping the way we learn. It is reasonable to assume he is referring to technologies such as the Semantic Web, since he later in the article discusses technologies undertaking cognitive processes previously carried out by learners (Siemens, 2005; Anderson, 2004). However, a clearer link between these two points may have strengthened the article. Ally, M. (2004). Foundations of educational theory for online learning. In T. Anderson & F. Elloumi (Eds. ), Theory and practice of online learning (pp. 15-44). Athabasca, Canada: Athabasca University. Anderson, T. (2004). Towards a theory of online learning. In T. Anderson & F. Elloumi (Eds. ), Theory and practice of online learning (pp. 45-74). Athabasca, Canada: Athabasca University. Barabàsi, A. L. (2002). Linked: The new science of networks. Cambrige, MA: Perseus Publishing. Duffy, T. M., & Cunningham, D. J. (1996). Constructivism: Implications for the design and delivery of instruction. In D. H. Jonassen (Ed. ), Handbook of research for educational communications and technology (pp. 170-198). New York: Simon & Schuster Macmillan. Perraton, H. (1988). A theory for distance education. In D. Stewart, D. Keegan, & B. Holmberg (Eds. ), Distance education: International perspectives (pp. 34-45). New York: Routledge. Vygotsky, L. (2002). Mind in society: The development of higher psychological processes. Cambridge, MA: Harvard University Press. This entry was posted in Constructivist Learning, Distence Education Theory and Research, Frameworks for Guiding Technology Use, Research and Perspective on Technology in Education on May 24, 2014 by Kelli.